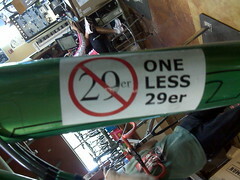 But aren’t 29er’s bigger than 700cs? Uploaded by arsbars | more from the Bike Hugger Photostream. Next Next post: SRAM Brake Lever?!!@@#$#!! !